Ultra Fine Flair: Fun Stuff! To make up for yesterday's holiday, our Spanish school offered a free conversation class this morning at a café in San Telmo. An instructor from the school came to give us an explanation of mate, the traditional beverage of Argentina. Mate is a very strong herbal drink that is served in a gourd and mixed with hot water (in Argentina, although in other countries it may be drunk lukewarm or cold) and sometimes sugar, depending on taste. (Mate is very bitter and we both liked it better with sugar.) The gourd is passed around a group. 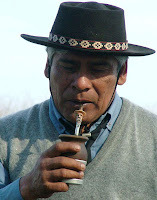 When it's your turn, you drink through the bombilla (straw) until the water is gone, then you pass the gourd back to the "cebador" (the person serving the mate) to refill. And you never say "gracias" until you don't want any more at all. After class today, we walked back to our neighbourhood (about an hour) and stopped at a sanwichería for a snack and a cerveza. We followed that up with the best deal on helados (ice cream) in Buenos Aires: A very small cone for only 2 pesos! That's 54¢ US. The best part is that this particular heladería is just a block from our apartment, and the guys working there are extremely friendly (I think they might have had a boy-crush on Ken, or at least his hair). Needless to say, we'll be back. We also need to get our asses to the gym, because the cerveza and helado are starting to take their toll! P.S. Pics soon; I'm still a little gun-shy about carrying about carrying and using a camera since the CRIME incident.